WE'RE GIVING AWAY 245 HOLIDAY LIP KITS! Whether you're on your way to a meeting, a happy hour, or even the back seat of a cab, our exclusive 3-pack lipstick has you covered all in a NY minute. Enter for a chance to win and keep them all for yourself or share them with a friend! Unfortunately, this Sweepstakes has ended. Sign up for our newsletter to stay in the know on Maybelline’s upcoming sweepstakes, plus receive the latest news on makeup trends, fashion, and beauty tips. Official Sweepstakes Rules: US Only. No purchase necessary. You must be over 13 years, a legal US resident. Starts at 12:01 AM ET on 12/1/18 and ends at 11:59 PM ET on 12/31/18. For Complete Rules, click here. 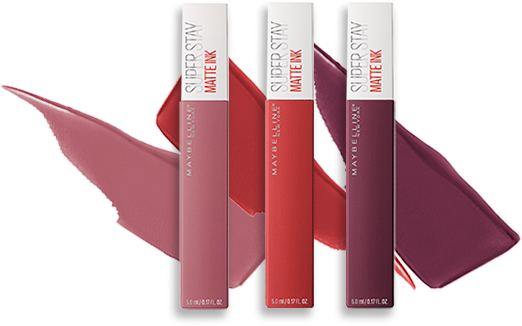 Don't forget to follow Maybelline New York on Twitter, Facebook, and Instagram for more sweepstakes, makeup tips, tutorials and info on the latest products from Maybelline New York. NO PURCHASE NECESSARY TO ENTER OR WIN. Void where prohibited. Open only to permanent legal residents of the 50 United States or D.C. who are 13 years of age or older. Promotion begins 12/1/18 at 9:00 AM ET and ends 12/31/18 at 11:59 PM ET. Prize restrictions apply. To enter and for the Official Rules and prize details, click here. Sponsor: Maybelline NY, 10 Hudson Yards, Attn: ICC Department, 32nd Floor, New York, NY 10001. Sorry, you've already entered the sweepstakes.